May I wish all members a Merry Christmas and a Happy New Year. I hope to see you all out and about in the 2018 camping season with DA’s and Sections. If you have never camped out side your Da or Section why not give it a try in 2018. There are lots of invite meets as well as a full camping programme from all DA’s and Sections. You can find details on web sites. You can also get this from the magazine or online. 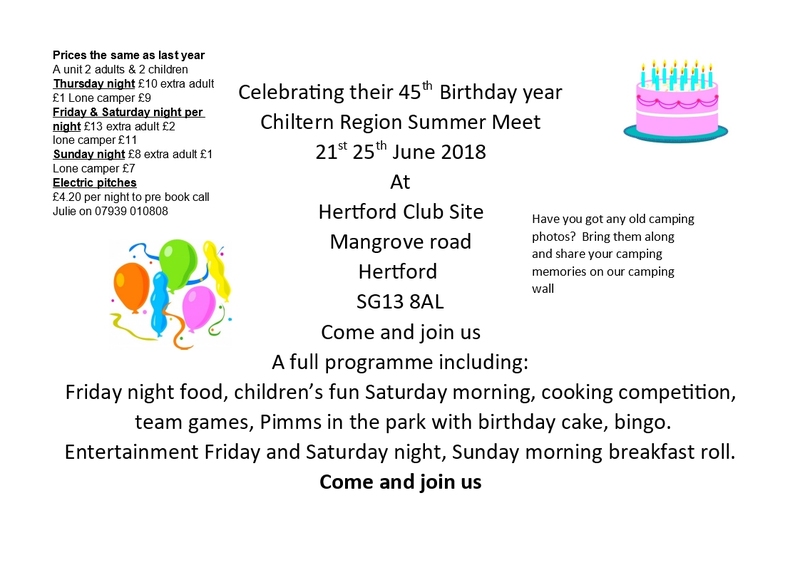 Chiltern Region Council do have council meeting on camping weekends, but everyone is invite to join the camping and socials that may also be laid on. Don’t forget to attend your Da and/or sections AGM. Make sure you bring your valid membership card. This allows you to ask questions. Remember if your Da or Section do not have enough members at their AGM it will not go ahead, so please support. Chiltern Region is one of the 13 Regions throughout the UK and Northern Ireland, that make up The Camping And Caravanning Club. Chiltern Region, is split in to 5 smaller D.A.’s (District Associations). These are: Aylesbury Vale DA, Beds DA, Bucks Herts And Middlesex DA, Herts And North London DA, Oxfordshire DA. There are also several active Sections operation in the Region. These are Club wide groups that usually have smaller sub groups in most Regions. The Region is over 40 years old (founded in 1973) and is still going very strong. Members are allocated DAs within their Region automatically when they join the Club. To find out which DA you belong to please check your card. Although every one is assigned a local DA when they join, there is no restriction as to who you can camp with in the Club. In fact if you are planing a holiday this year, look around to see if any local DA’s have holiday meets on in the area. Holiday meets are longer meets some times 4 weeks long and are a good base to go off and explore the best of Britain. Do be aware however you may need to book with the DA in question ahead of time. To go to any of these meets however, you must be a member of the Camping And Caravanning Club. To become a member you can either Join Online or visit your Local Club Site. We hope to see you out and about soon! Full Programme available Click Here for more details.